We focus on high quality and stability of Herbal Extract,Fruti Powder for health,food,cosmetics industry. 12 years experience,high technology and all-round quality control approaches always assure high and stable quality of our products and services. Our company is the professional manufacturer of plant extract and other natural ingredients in China. We supply high-quality material for pharmaceutical, health products, cosmetics beverage and other industries. We are located in High-tech Zone, Xi'an City, Shannxi Province, China, and we have passed ISO, KOSHER certification. Our products have been widely used in pharmaceutical, health product, cosmetics, beverage and other industries. 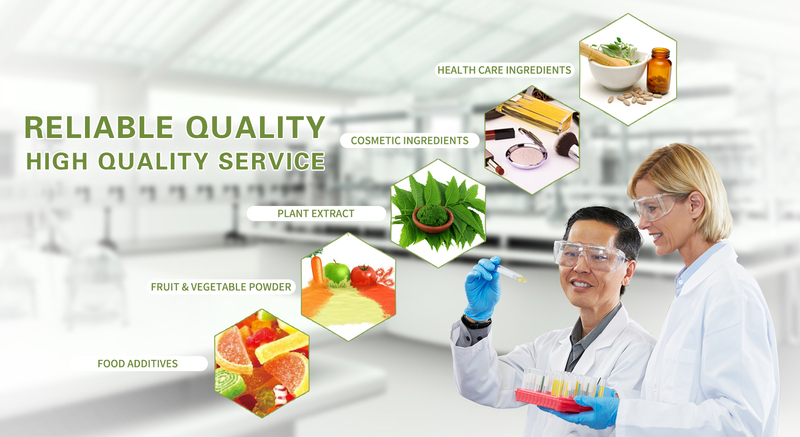 As a professional manufacturer of plant extracts, we stick to offering high quality product with competitive price and good service to our customers. We put the whole operation of our factory under strict quality control, from the planting and purchasing of the raw materials, till the manufacturing and packaging of the products. Therefore, we assure the quality of the material which you purchase.